Lorenzo Angera Cabernet Matte Briar Pipe - This pipe comes with a special Lucite two piece tenon stem removable insert. 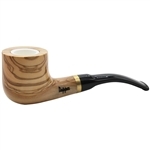 It gives you the choice to make the pipe either a 9mm or regular tenon smoking pipe. A decorative ring connects the shank to the straight stem. The tobacco pipe is stamped with the pipe name, Angera, and the makers name and country, Lorenzo, Italy. A Lorenzo logo drawstring pouch is included. 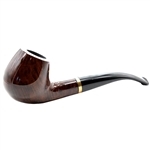 Lorenzo pipes are made in northern Italy from top grade briar wood sourced from the Mediterranean area. These pipes are known for their beautiful grain and great smoking quality. The history of Lorenzo pipes goes back to early 1900's and they are still held in high regard in today's pipe smoking world. Lorenzo pipes give years of smoking pleasure at an affordable price.